I've been a music fan most of my life, and came of age in the early and mid-70's. But even with music as another major hobby in my life I'm pretty sure my fondness for comics had an influence on my early musical choices. Nothing else really explains my attraction to bands and performers in costume. Alice Cooper was the first act I ever really got into. I was just young enough to have missed the real Glam Rock scene, so even though I had a couple of David Bowie singles he was well into his Berlin period and past the Sci Fi Ziggy Stardust era I no doubt would have been crazy about. 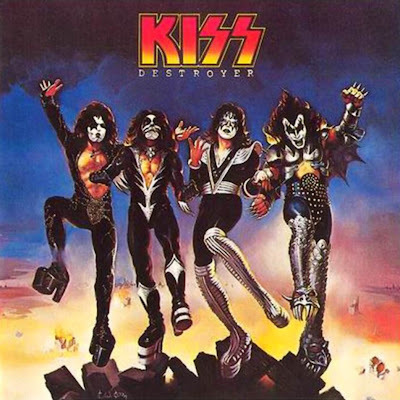 I loved Elton's costumes and I know for a fact that I bought my first KISS album, Destroyer, without knowing anything about what they sounded like, simply because they looked like superheroes on the cover. These bands are all considered legendary now, but for the most part, back home in my rural surroundings, I was the only person I knew who dug Queen more than Bachman Turner Overdrive. This blog isn't meant to recount all of my music anecdotes. I'll probably come back to some of those as time goes on. This serves primarily as an introduction to the topic of my musical tastes, and the fact that I got made fun of for a lot of them back then (even for Alice and KISS). I think the costumes and the shows were off-putting to a lot of my peers. I realize now that even more off-putting was the androgyny and sexual ambiguity of Glam Rock. Now, this was the 70's and while I now know the topics of homosexuality and gender-bending politics were a big part of this scene (as well as the Disco scene of the era), these weren't topics that anyone was very comfortable talking about back home in rural Greene County. I thought Freddie Mercury's flamboyance made him a great performer, and honest-to-god the idea that he was gay really never crossed my mind. I'm going on record here to say that at that age, and at that time, it simply didn't occur to me. I don't know if that's more of a testament to how things have changed since then or to my naivety. But there was one band that, while I liked their music, made me a little uncomfortable. I read about Angel in some rock magazine. The rumor in that mag was that Angel was actually the members of KISS, out of makeup, playing in this band as a side-project. They were the light counterpart, sort of a Yin Yang image, of KISS. That was untrue of course, and it was obvious for a number of reasons. Even with their makeup on the shape of the faces were completely wrong. But as a KISS fan it got my attention. If they sounded anything like KISS I wanted to hear it. Okay, now turn your computer screen upside down and look at it again. Pretty cool, hunh? Pretty Gay, isn't it? You should see the band pictures on the inside. These guys were pretty. I've never really wrestled with those issues. I've pretty much always liked girls. I have however been targeted for a lot of teasing and misunderstanding by other people for those issues. That's the danger of growing up as an emotionally open and sensitive man with an artistic temperament. To be fair, I listened to a lot of bands with men in makeup and tight costumes and my primary hobby was comics, which featured mostly muscular men in tights, so I can understand where the assumptions came from. When I was younger this bothered me. Now, as an adult who is comfortable with his sexuality (and with anyone else's, just for the record), I don't really care. But Angel was just a step beyond, and I think it hurt their success. They toured the arenas, released several albums (including a live one), but never really caught on the way Casablanca hoped they would. I think there were a lot of reasons for this. They appeared a little late to really cash in on the androgyny of the Glam Rock fad, and that never caught on in America the way it did in England. We're a little more homophobic as a society, I believe (and yes, I know that's debatable, and not what this post is about). They used keyboards, which made their sound a little too Prog Rock for the hard rock fans. They were a little too hard rock for the Prog fans. Rock is the Devil's music and these guys were dressing in pure white. They weren't dangerous. A decade later the airwaves were filled with hairbands who overcame the androgyny of makeup and flamboyant costumes with a bad boy attitude. But Angel was... pretty. They broke up, and were for the most part forgotten. Somewhere along the line I lost the White Hot album. I'm fairly sure it got mixed up with a college roommate's massive vinyl collection. I'm not accusing him of anything, but Steve, if there's a copy of this in your house it's probably mine (you can keep it... I replaced it on CD a few years back). Last winter I played White Hot for the first time in awhile. I've had the CD for a few years and had enjoyed the nostalgia factor, but for some reason this time it really clicked again. I did some digging and got the rest of their discography and have been really into it again. It's absolutely filled to the brim with over-produced pomposity and Glam Rock majesty. It's silly and over-the-top and it rocks. You can hear a lot of tracks on YouTube, but this is one of the few actual live clips I found. Yeah, this is one of the reasons I was made fun of, but you have to love any band that uses the word "halcyon" in a song lyric. Oh yeah, they provided the title song for the movie 20th Century Foxes starring Jodie Foster and Cherie Currie of the Runaways. This is wild... almost Spinal Tap level of preposterous. I'll admit, I do like their logo. The rest, their angelic beauty and sound, wow! It begs the question, where are they now and will they make a come-back? The singer and drummer reunited around 2000, and filled in the rest of the line-up with new musicians. They released an album that isn't as good as the early stuff (no keyboards, which for good or ill was a signature of their sound). Since then... no idea.